Swimming, diving, memories, and laughter fill your summer when you run a commercial pool. Regardless of whether you manage a local pool in your community or at a hotel resort, people depend on you to help create their summer memories. You do not have time for the sad “pool closed” sign, but leaks can sneak up like a summer heat wave. 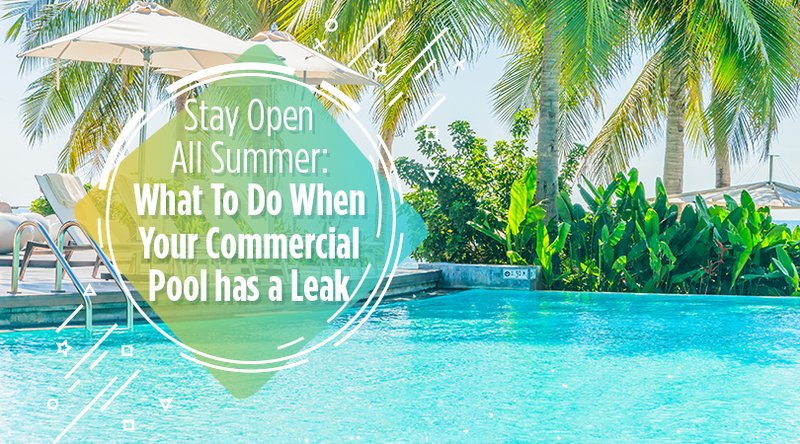 No one plans on a leaking pool, but it doesn’t have to mean it’s closed for good. The worst thing you can do when you know you have a pool leak is to ignore it. Yes, some people ignore leaks, but they will become bigger problems. Scheduling a half a day of downtime to find and fix the pool is better than closing it for weeks. Large commercial pools require ongoing maintenance and one tiny leak can equal hundreds or thousands of gallons of water lost per day. Here’s what Aquaman Leak Detection recommends to do when your commercial pool has a leak. A good indication you have a leak is when your utility bills suddenly increase or you notice the water level lower than normal. Either way, it’s impossible to know if you have one large leak or several small leaks, so it’s pertinent to contact a professional leak detector. You may know how to detect a leak, but more people with leak-detection equipment will ensure you find all the holes in your pool liner or cracks in the cement. They can also do a full inspection of the pumps, filters, and other pool parts to ensure other potential problems don’t cause issues throughout the summer. The work is not done once the pool leaks are fixed. The water level and chemicals need to be monitored closely. Too much chlorine can damage the pool liner and create unsafe swimming conditions. Changing pool filters regularly will help prevent clogged plumbing and premature pump replacement. Always call a professional commercial pool repairman for major repairs, including pump installation and leak detection. A public pool in Austin, Texas was 59 years old and leaking 50,000 gallons of water per day in 2016. This may seem over the top, but older commercial pools bring a series of problems when a leak goes undetected for years. The estimated cost was $200,000 and it only guaranteed the pool for seven more years of operation. Of course, 59 years is a long time for a pool to remain in service, but water under a foundation is always bad news. This creates an unsafe situation, especially for a community who has grown to love the years of summer memories. Keep your mind at ease with opening day just around the corner for your commercial swimming pool. Contact Aquaman Leak Detection in Brevard County, FL to schedule an inspection of your public pool. Our licensed technicians are often able to identify and repair a leak in one visit.